"Flying Saucer Crashes Near Crystal Springs,"
with the deck stating, "Mangled Bodies Seen In Debris," and "
Witness Says Object Marked 'U.S. Gov't.'." on their Saturday morning paper for May 13, 1950. Bobby Mohon called the Jackson paper late Friday night from Crystal Springs with the story of how a flying saucer had struck a power company transformer on the night of May 12, causing an electrical outage in the city. He reported mangled bodies laying near the wreckage which had markings indicating it was an unusual military aircraft. In 1950, the term "UFO" had not yet come into usage, and "flying saucer" was used for unidentified flying objects of any shape. Mohon's saucer was actually described as cylindrical, and "definitely not an airplane." 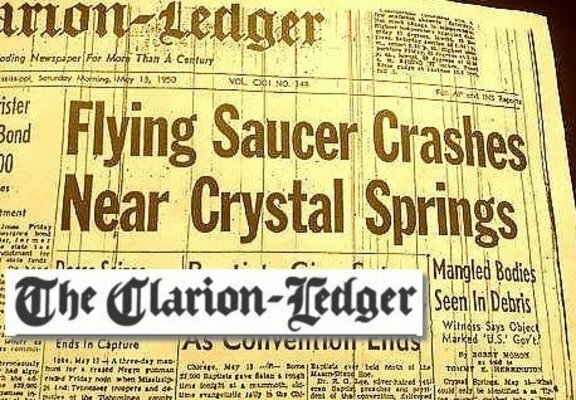 The Clarion Ledger scooped the nation with the saucer news, and credited the witness as co-author of the story, along with reporter Tommy E. Hederman. The story was rushed to press and was on sale Saturday morning before all the facts were in. The investigation by Crystal Springs authorities was reported later the same day by other area news papers. 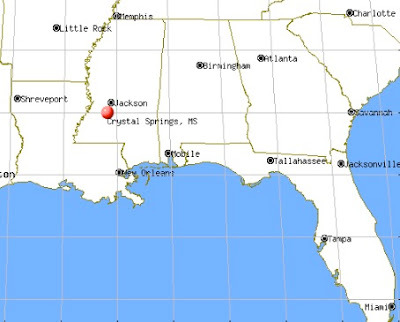 Crystal Springs, Miss., May It (UP) A power shortage and an unconfirmed report that a cylindrical object had crashed into a transformer gave Crystal Springs a "flying saucer" scare this morning. The Jackson (Miss.) 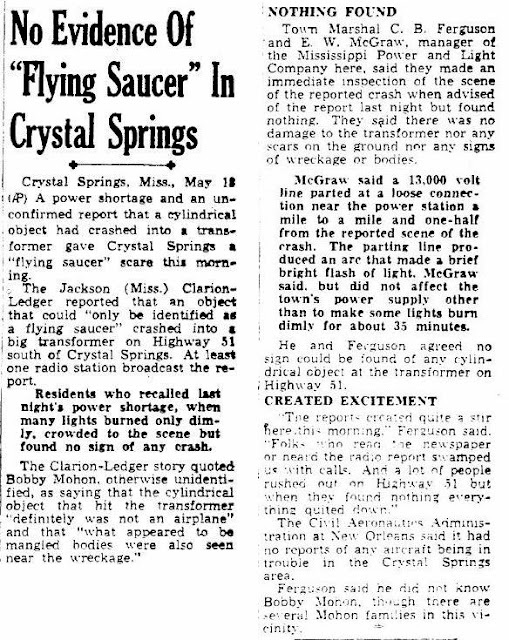 Clarion-Ledger reported that an object that could "only be identified as a flying saucer" crashed into a transformer on Highway 51 south of Crystal Springs. At least one radio station broadcast the report. Residents who recalled last night's power shortage, when many lights burned only dimly, crowded to the scene but found no sign of any crash. 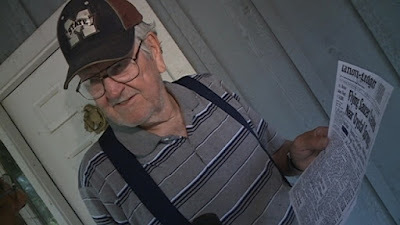 The Clarion-Ledger story quoted Bobby Mohon, otherwise unidentified, as saying that the cylindrical object that hit the transformer "definitely was not an airplane" and that "what appeared to be mangled bodies were also seen near the wreckage." NOTHING FOUND Town Marshal C.B. Feguson and E. W. McGraw, manager of the Mississippi Power and Light Company here, said they made an immediate inspection of the scene of the reported crash when advised of the report last night but found nothing. They said there was no damage to the transformer nor any scars on the ground nor any signs of wreckage or bodies. McGraw said a 13,000 volt line parted at a loose connection near the power station a mile to a mile and one-half from the reported scene of the crash. The parting line produced an arc that made a brief bright flash of light. McGraw said, but did not affect the town's power supply other than to make some lights burn dimly for about 35 minutes. He and Ferguson agreed no sign could be found of any cylindrical object at the transformer on Highway 51. CREATED EXCITEMENT "The report created quite a stir there this morning." Ferguson said. "Folks who read the newspaper or heard the radio report swamped us with calls. And a lot of people rushed out on Highway 51 but when they found nothing everything quieted down." The Civil Aeronautics Administration at New Orleans said it had no reports of any aircraft being in trouble in the Crystal Springs area. Ferguson said he did not know Bobby Mohon, though there are several Mohon families in this vicinity. The flying saucer not the only thing that was missing. There was also no trace of Bobby Mohon, the witness who had reported it. The real puzzler in this case is not why a hoaxer would report such a story, the question is why a reporter would accept it, or why an editor would print as a featured headline without verifying the facts. We're lucky, really, that the hoaxer included details that allowed the story to be so quickly disproven by the authorities and subsequent journalists. 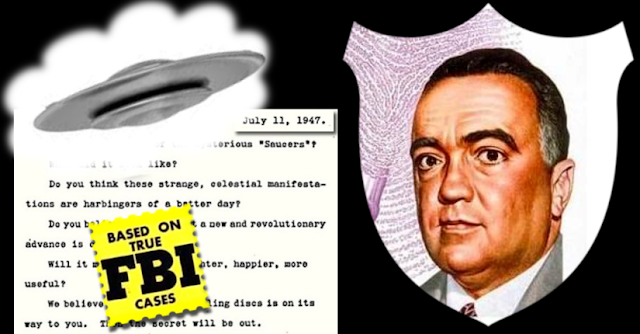 If it had been a typical tale of a UFO encounter in a area, the resulting headlines might have made it into saucer history as an authentic case. The Jackson, MS, television channel WAPT interviewed Bobby Mohon in 2015 on the 50th anniversary of the story. Mohon said a friend from a rival baseball team in Crystal Springs admitted he'd called reporters with the UFO crash story and used Mohon's name as a prank. "I had nothing to do with it. I didn't find out about it for two days,” Mohon said. “I was at Mississippi State trying out for a baseball scholarship. When I got out there, there was news people from New Orleans, Jackson, all over the place asking questions. I didn't even know what they were talking about."